The land for sale is surrounded with a special net and at the top of the land is a hut, giving the hunters the possibility watching their dogs whilst the training. The land is just 50m from the paved main road, 3,5km from the village with its kafenio/tavern and shop, and the sandy beach of Pigianos Kampos is in a distance of 7km. Water is available, and electricity and phone in a distance of approx. 2,5km. As to these days the land was used as training farm, a topographical plan and forestry permit is currently not available. The Municipality of Arkadi consists of the 13 communities of Adele, Amnatos, Ancient Eleftherna, Eleftherna, Erfi, Kyrianna, Messi, Pangalochori, Pigi, Prinos, Skouloufia, Chamalevri and Charkia. The seat of the municipality is Adele. The municipal department is located east of the town of Rethymno and extends from the beach of Adelianos Kampos to the northern side of the Gardiki hilltop. 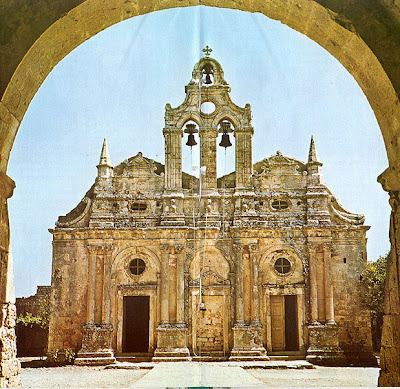 Just 25 kms from the historic town of Rethymnon you can take a local bus or you can book a tour of the most important site in the area of Rethymnon - Arkadi Monestry, a living monastry with an heroic history. Immaculately situated in the foothills of Psiloritis Mountain (Mount Idi), Arkadi is something of a national shrine. During the 1866 rebellion, the monastery served as a Cretan stronghold in which hundreds of Cretan guerrilla fighters and their families took refuge as the Turks advanced and had the upper hand in the proceedings, it was here that they were surrounded by the Turkish army that lay siege for two days, finally the defenses were breached on November 9th, 1866.